The ESABASE2 geometry editor allows to change all geometry related parameters such as the object size, meshing parameters, pointing, attitude and kinematics, and shielding (wall design) parameters. 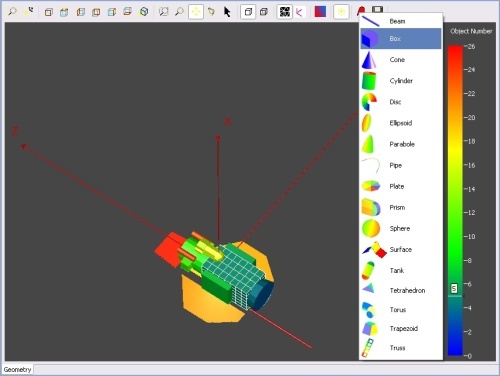 The following image shows the ESABASE2 geometry editor window. The editor toolbar contains different options to set the geometry view, but also to create and manipulate single objects of the geometry model. After selection of one of the shapes from the “Add object” button, a wizard will be opened which guides the user through the specification of all relevant object parameters. Manual translation and rotation of objects is possible and facilitated by a simple “snap object” functionality which can be switched on and off.